Odometer Display is Dark (does not illuminate). Gear Shift "PRNDL" Display is Dark (does not illuminate). NOTE: This service will result in a repair of the two items descibed above only. If your speedometer or odometer, or other gauges do not work, or if you have other problems with the instrument cluster, this service is NOT for you. 1/3 The Price of Buying NEW! NO Reprogramming and NO Core Charge! Installation is quick, only hand tools are required. No scan tool or special experience is necessary. FREE Next Day Air Round Trip delivery & 1-3 day rebuild turn-around-time ensures minimum vehicle downtime. NOTE: When checking out with this product, in the shopping cart, please select the "FREE SHIPPING" option to receive FREE Next Day Air Delivery.. 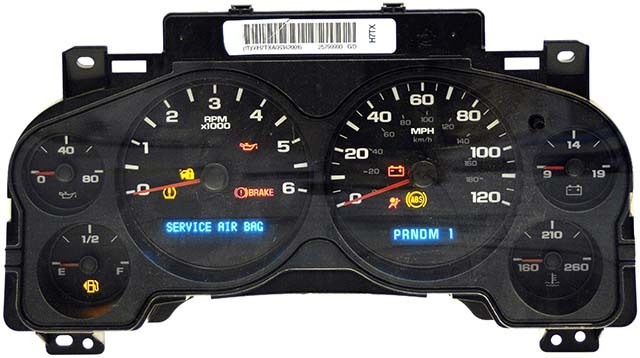 If the Instrument Cluster received is fully functional, meaning "no repair is necessary" your payment will be refunded minus a $65 inspection & handling fee. Free inbound UPS Ground Shipping IS NOT included. In these territories, the customer will pay for US Priority Mail shipping to our rebuild facility. Return shipping is included free of charge. Expect vehicle downtime to be ten (10) business days. * Free inbound UPS Ground Shipping IS NOT included. In countries outside the USA, the customer will pay for shipping to our rebuild facility. Return USPS Priority Mail shipping is included free of charge. The purchaser is responsible for paying his/her countries import duty taxes, customs fees, and local taxes.